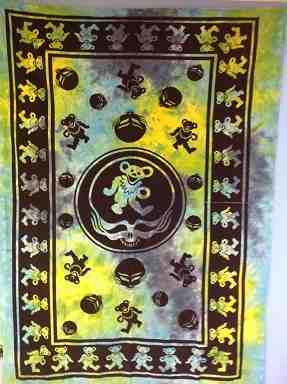 A beautiful Grateful Dead Indian Print Tie Dye Tapestry that has been created using traditional Indian dyeing methods on 100% cotton fabric. 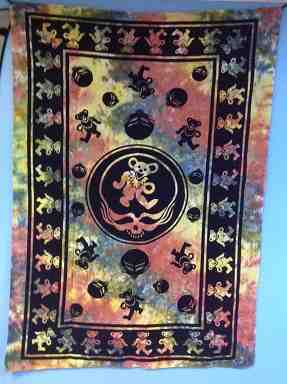 You'll see classic Grateful Dead imagery including skulls, a stealie, and dancing bears. It can be used as a wall hanging or bed covering and would look fantastic in a college dorm or apartment. Measures approximately 60" x 80". Available in a blue-aqua tie dye color pattern or the classic multi color tie dye pattern. I received my package in a timely manner and have really enjoyed the Tapestry. The size is great and the colors are awesome! !